We are very excited to announce the product launch our new brand, ´Perfectly Balanced” which are sold exclusively in all Woolworths stores across Australia. With this range it’s never been easier for well-intentioned parents to hide nutritious vegetables from fussy kids and serve the whole family with the beloved meat and two vege combo. Perfectly Balanced is one of the first products on the Australian market that meets the needs of the emerging flexitarian trend and supports a healthy eating lifestyle. It’s really just a fancy term for anyone looking to eat a more balanced diet – think a little less meat and more veggies. Perfectly Balanced is a delicious solution to easily increase the amount of vegetable goodness you and your family eat, whilst still allowing you to enjoy the wholesome meat proteins you know and love. Don’t go without, go together! With a 4 Health Star rating, and free from grain, dairy and artificial flavours and colours, Perfectly Balanced takes out the stress of cooking dinner. All products can be easily grilled, fried or or popped in the oven for quick meals that are a little healthier, a little better and a whole lot easier. 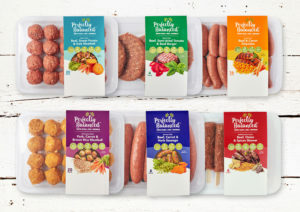 The Perfectly Balaned range includes Beef, Carrot and Herb Sausages, Meatballs with Sweet Potato, Beef and Kale or Pork, Carrot and Brown Rice, Beef and Carrot Chipolatas, Skewers with Beef, Onion and Spices, as well as Beef, Semi-dried Tomato and Basil Burger.